GREEN GRASS BLEND - 32 oz. Green Grass Blend - 32oz Shaker Bottle. Our finest green foam blend. This popular ground texture is manufactured with just the right amount of natural highlights! Used as your base of operations when applying scenery. From here you will add the additional texture you will need for your scene to come alive. GREEN GRASS BLEND - 64 oz. Green Grass Blend – Super Value 64oz Refill Jug. Our finest green foam blend. This popular ground texture is manufactured with just the right amount of natural highlights! Used as your base of operations when applying scenery. From here you will add the additional texture you will need for your scene to come alive. Green Grass Blend – 48 oz Eco-Pak. Our finest green foam blend. This popular ground texture is manufactured with just the right amount of natural highlights! Used as your base of operations when applying scenery. From here you will add the additional texture you will need for your scene to come alive. SUMMER LAWN BLEND - 32 oz. SUMMER LAWN BLEND - 64 oz. Summer Lawn Blend - 48 oz Eco-Pak. A wonderful blend that captures the look of that "late" summer lawn. 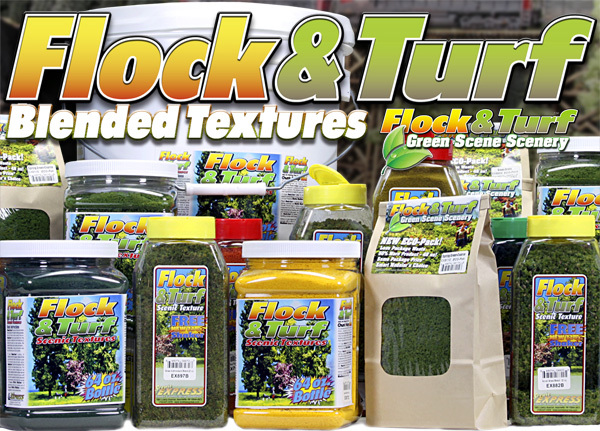 You can layer this blend with our Green Grass blend allowing you to feather the lawns together, giving it true color match and texture. SCRUB GRASS BLEND - 32 oz. SCRUB GRASS BLEND - 64 oz. ALPINE MEADOW BLEND - 32 oz. ALPINE MEADOW BLEND - 64 oz. FARM PASTURE BLEND - 32 oz. FARM PASTURE BLEND - 64 oz.